Go ahead and play in the mud! 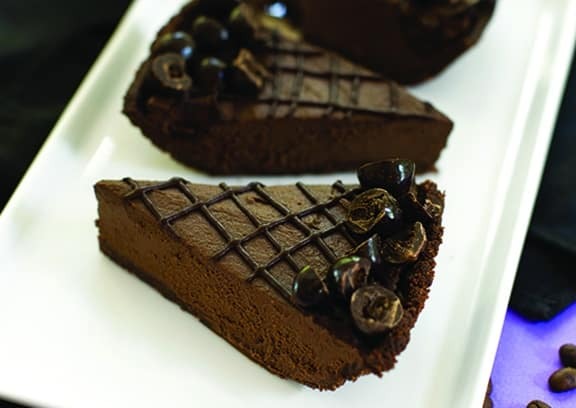 This vegan mud pie is inspired by the call for a “cup of mud,” which is of course simply coffee, and the outrageously chocolaty affair known as Mississippi mud cake, it’s as dark and intense as a fresh brewed cuppa, but with all the trappings of an elegant dessert. Don’t be misled by the funky name—this kind of mud pie is far tastier than any childhood sandbox creation. Perfect for a pie novice, this is an effortless dessert with a big flavor payoff. Recipe and photos from Easy as Vegan Pie by Hannah Kaminsky. © 2013, Skyhorse Publishing, reprinted by permission. Once your crust is baked and cooled, combine the chocolate, agave, and nondairy milk in a microwave-safe container. Start by heating for 60 seconds, stirring vigorously to help the chips melt. Heat for additional 30-second intervals, stirring well after each, until the mixture is entirely lump-free. Transfer the melted chocolate into the bowl of your food processor or blender, along with the pitted and peeled avocados. Add the coffee powder and salt, and let it rip! Blend until pureed to a flawless, silky-smooth consistency, pausing periodically to scrape any unincorporated avocado off the sides of the bowl. Pour the thick mousse into your prepared crust, smooth out the top with a spatula, and chill for a minimum of 2 to 3 hours, to allow the filling to set. For the ganache, simply melt together the chocolate and nondairy milk using the same method as before. Drizzle all over the top of the pie, and don’t hold back—let your inner Jackson Pollock out and make it a chocolate work of art! 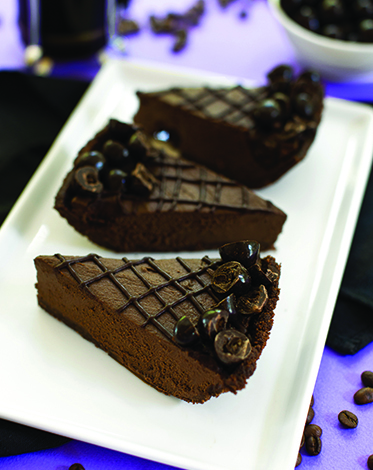 Finish by sprinkling chopped chocolate-covered espresso beans around the rim. Take a moment to admire your masterpiece before it’s devoured. Cut into wedges to serve. I don’t use coffee. Is it possible to use coco powder or another substitute instead? If so, how much? Thanks for all the great recipes. It really helps when changing from a vegetarian to a vegan. Janet, so sorry for the delayed response — I think you could safely leave out the coffee, as there is already a very strong chocolate flavor to this. This is better than most restaurant’s $11/slice chocolate desserts. Rich and decadent, smooth and delicious. No one would ever know it was made with avocados. Thank you! Kudos to its creator, Hannah Kaminsky.